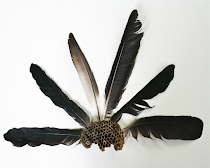 The Plumed Nest: Vote in the Project Runway and HP Ultrabook™ Bag Contest! 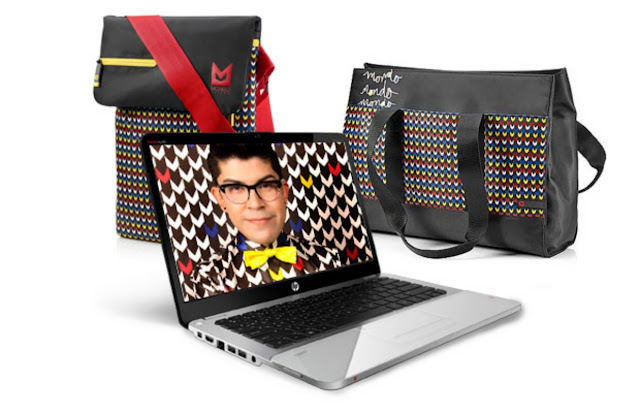 Vote in the Project Runway and HP Ultrabook™ Bag Contest! I am really excited to share this post with you today about a recent contest put forward by HP + Intel + Project Runway! First I love me some Project Runway. I have been watching the show since the beginning. In fact I think it is one of the things that inspired me to start sewing again and I am sure it has inspired many people. Tim Gunn's famous words of "make it work!" has motivated me on many occasions. Now if you watch the show you know many of the contestants have been trying to "make it work" for years but we also know it's a tough business. And I think it's fabulous that it gives designers the chance to be seen, to be challenged and to possibly reach heights that takes years to reach in a relatively short period of time. It's also really fun to see everyone be able to take their skills and use new products in their design process. In recent seasons the contestants have been supplied with amazing digital equipment. Each time I watch project runway I am drooling over the design suit they get to use provided by HP and Intel. In fact the last episode was the HP challenge where the contestants made their own fabric. Oh, it's one of my favorites because I have been in the process of trying to teach myself textile design for the last several months - hence the drooling. For me, as a home fashions designer, technology is a constant part of my creative process. It's definitely the part that people don't see. They might not even know how integral it is in my process by looking at the handmade products I make. But trust me it's there. I spend as much time with technology as I do with needle and thread. As technology has become a integral part of fashion, art and design, it makes sense to want some fashionably designed technology and a fashion forward accessories to carry it all around in too! Not to mention as technology becomes even more present in our daily lives, the melding of technological fashion is also emerging. Hoodie headphone, anyone? Yes, it's happening. I love this contest because as a mom and designer who works from home lugging a briefcase or a big and boring black laptop bag around isn't really my thing. I take my laptop with me to go to cafes or parks with my kids so they can play and I can squeeze a few hours of work in. For me technology and fashion converges when it's both durable as well as represents me as a creative person - who also happens to use technology in my line of work. A great laptop bag for me would be something that is stylish, not too big and bulky but can withstand grubby little hands or a park bench. Oh, and a built in charger would be fantastic too, wouldn't it?! Obviously our friends at HP + Intel + Project Runway have taken note that this is a missing accoutrement for us folks and are setting off to bridge the gap between fashion and technology. The best part is that they sponsored a contest in which anyone interested in designing a laptop bag could enter. Again, love that this was opened up to the public! The winner will receive $10,000 and the top five will win HP Spectre XT Ultrabook™ inspired by Intel. Mondo Guerra, the season 8 HP/Intel challenge winner and Allstars Project Runway winner, kicked it off with his line of HP Ultrabook™ bags. You can find out more about his designs and see them all here. You can be apart of it too by voting for your favorite! Check out the 40 finalists and cast your vote here. You can cast one vote per day until voting ends on 9/26. So, go now and vote! I'd love, love, love it if you would come back and tell me what your favorite design is. Also, let me know, what would you like to see in a technological savvy fashion forward design? My girls bought me a Vera Bradly laptop bag a couple of years bag. I feel to stylish when I carry it. Accessories are definitely necessary for girl bloggers! Those are incredibly cute. My electronic devices would shudder to see that they could have been traveling in something as awesome as these bags. Love the one on the right. I think I need to re-think my conference baggage! I envy the artistic talents of designers - I myself lack any of that skill! I would love to see personalized items incorporated in technological savvy gear. i think that's why i love project runway so much - it's just so impressive. i sew, but making and designing clothes? that takes a talent i just haven't found within myself . . . maybe someday?? I like the one you like best too. Also, couldn't help but notice your quotation on the right--I love that as well!!! "No one looks back on their life and remembers the nights they had enough sleep!" Thanks for the follow--following back! ha! that quote makes me feel great about never getting enough sleep! but it's true, definitely true. 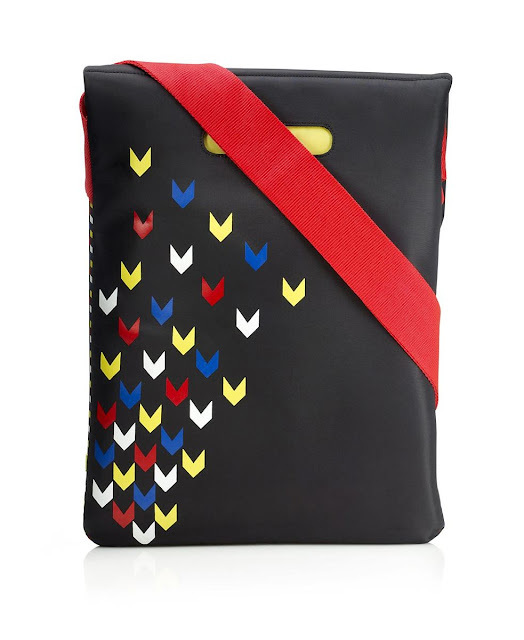 Something cool to carry my lap top in, is definitely on my current list of must haves. Off to check out the contest- thanks for sharing!